The best exercises to gain muscle mass according to science. The exercises that generate better results in terms of increasing or building muscle mass are those that collect more muscle fibers in each movement, and which also force safe and wide ranges of movement to generate a good stimulus that allows adequate hypertrophy without the risk of injury. Best Muscle Building Exercises According to Science. Of course this safety in the range of joint movement is rooted on the flexibility that a person has or is acquiring, since flexibility is a quality that gives strength to a muscle and therefore allows you to perform exercises with higher loads to try to increase your muscle volume (muscle hypertrophy). Best exercises for your workout program. And be aware these exercises are not like those those that usually upload empirical people on their profiles in instagram. These are very traditional exercises really, and at the same time safe exercises if you execute them well, without compromising the technique of movement, if you run with wide ranges of motion according to your own capabilities, and of course you must lift challenging weights in order to get mor muscle volume. 1. Press Arnold with dumbbells. With this exercise you stimulate the movement of shoulder flexion mainly. Usually it is an exercise designed for the work of the anterior fibers of the deltoid muscle, but of course also participate as antogonist or indirect action muscles such as the brachial and coracobrachial triceps and in one way to another the pectoralis major, serratus and the muscle of the scapula. 2. Military press with barbell in front. The transverse military press is also a good exercise, however it is very risky for beginners and even for the more advanced, so the military press with barbell placed in the front is safer and with it are also stimulated the deltoid muscles ... depending on the grip you will be working more on the lateral fibers (grip more open) or on the front fibers of the deltoids (grip more closed). ... This exercise can be done sitting or standing (just like the previous one). However, I always recommend better performing exercises standing up for a better stimulation also of the core area and to work on the balance part and body stability. 3. Shoulder dumbbell side lifts. As you can see in the image, you can also grab the dumbbells with the palms of the hands facing the sky, the difference would be that with this type of grip you will be stimulating the brachial and coracobrachial biceps muscles, the muscle trapezoid to a lesser extent, the scapula muscle and the serratus. Of course the most direct work is done by the lateral fibers of the deltoids and the anterior and posterior fibers of the same muscle. 4. Dumbbell lateral lifts with flexed trunk. 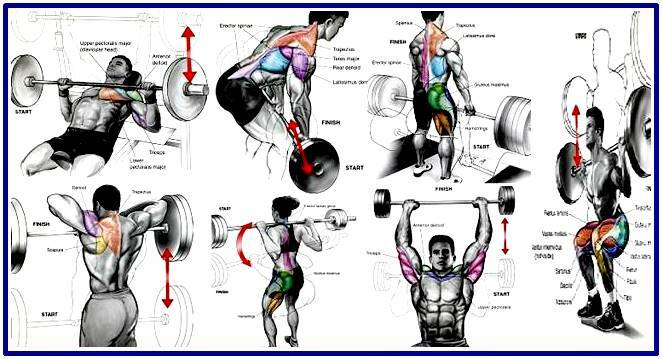 It is an excellent exercise to mainly stimulate the posterior fibers of the deltoids and to work on the trapezius muscle. Of course, other you will also stimulate muscles such as the dorsal width, buttocks, abdominals, among others, especially when standing, as shown in the image, which is the best way, enter into indirect action. 5. Rotations in circles and fron to back with disc or dumbbells. The ideal is to try that in each turn of the disc the arms always remain as stretched as possible. For this reason a decent but manageable weight should be used, especially for the work done primarily by the fibers of the deltoids. However, if the weight increases and therefore the flexion of the arms also (as the image shows), the muscular stimulus decreases in the deltoids and increases more in the arms especially in the biceps and biceps brachii muscles and in the flexors of the forearms. Of course the muscles of the core zone, among others, also get some degree of stimulation. 6. Bench press with barbell or dumbbell. It can be made with barbell or dumbbells and with a bench with different degrees of inclination. Usually it is chosen to do it with dumbbells to improve the part of balance and / or when one of the sides is stronger than the other so as to over time to balance these forces. Already in terms of inclination, the inclined bench is used for a more focused stimulus on the upper fibers of the chest, the bench without inclination stimulates these fibers in a balanced way, and the declined bench allows more work on the inferior fibers of the pectoral and the serratos. Of course the triceps brachii muscles, deltoids, among others, also receive some degree of stimulation. 7. Openings with pulleys focused on the pectorals. The main focus of this exercise is the work on the pectoral muscles (major and minor fibers), but of course also stimulates other muscle groups such as the core area, serratus, deltoids and the arms and forearms muscles. It is ideal for a balanced development on both sides. There are different ways of performing them, from simpler to more complex ones in terms of the degree of inclination and / or opening of the arms. The main stimulus lies on the pectorals, but the arms and core area also receive a very direct and good stimulus. They can be worked with repetitions to the fault executed of explosive form or with slow repetitions in its eccentric and concentric phase. The same applies for the rest of the exercises that I mention in the article. 9. Hand Stand Push ups. It is an excellent exercise for the work of the muscles of the arms and the upper part of the scapula as the shoulders and elevators of the scapula along with the trapezius muscle, although of course the muscles of the core area, the pectorals also the muscles of the glutes and legs, also receive some degree of stimulation since they also help to maintain the position. They range from beginners to advanced locations. 10. Front and transverse pull ups. Both exercises are very similar and stimulate directly and indirectly almost the same muscle groups. The difference is that the transverse pull up allow more work on the trapezius muscle and at the same time is more risky for glenohumeral joints, so it is not a highly recommended exercise for beginners nor even for advanced. 11. Squats with dumbbells or barbells. The free squat with barbell or dumbbell is an excellent exercise to work in a beastly way mainly the muscles of the legs and glutes. Of course the core area, the trapezius, shoulders, arms and pectorals also receive a considerable stimulus with this exercise, so it is a very complete one that should not be lacking in your training routines. It is a very good exercise for a work focused mainly on the glutes, the posterior muscles of the legs and on the dorsal width. Of course the arms, shoulders, abdominals and trapezius muscle receive a stimulus also quite pronounced, so it is a very complete exercise and another of which should never be missing in your training routine. It is a more focused exercise to stimulate leg muscles. It can be used with or without pulley and with or without inclination according to the level and facilities of each one according to gym. 14. Standing Calve rises with barbell or dumbbell. It is a very good exercise to allow stimulation focused on the triceps sural (twins and soleus: calves). The buttocks, the posterior muscles of the legs, and to a lesser extent the trapezoid (when performed with barbell) and arms, also receive some degree of stimulation. 15. Leg extension for quadriceps. Excellent exercise to hypertrophy the muscles of the anterior part of the legs, more specifically the quadriceps, and at the same time strengthen the knee joint since these muscles are what support it. 16. Flexion for femoral biceps. It is an exercise focused on the direct and pronounced work of the muscles of the back of the legs, and also of the glutes. The wide dorsal muscle (or poorly called lumbar muscle) also receives good stimulation from this exercise. 17. Exercises focused to work on the brachial biceps and triceps brachii. The exercises shown in the previous image and similar ones are essential for a focused work on the muscles of the anterior part (biceps brachii, coracobrachial, brachialis and flexors of the forearm) and posterior (triceps brachii and extensors of the forearms) of the arms. 1. Give muscles reasons to grow. If you train with a very light weight you will not be able to increase much the volume or the strength of your muscles. Although it is necessary to emphasize that strenght does not always depend on the muscular volume since the nerve impulses play the most important role. Therefore, people with a lower body mass are sometimes observed who have more strength to move or lift external loads and / or their own body weight, compared to other more voluptuous people. 2. Train for what you want to achieve. If your goal is merely aesthetic, you do not need to kill yourself by practicing a very exhausting type of training such as Crossfit, insanity or similar. If your goal is esthetic and you are interested in improving your performance for health and / or because you want to compete, then maybe some of the training and / or practice of sports such as soccer, volleyball, rugby, martial arts, Etc., is something that you should seriously think about. 3. Nutrition, rest and other good habits of life. If you train like a beast but you feed like "beggar" and you sleep little or have some poor quality sleeping time, then you simply will not achieve a good muscle recovery and therefore your muscles will not hypertrophy, and in fact they can atrophy and also the risk of injuries can increase considerably. 4. Weights or calisthenics? Some people with a very good genetic potential may be able to achieve good results in muscle volume by exercising only with their own body weight, but there will be those who will have to train with external loads of weight to achieve good results no matter what. Angleri, V., Ugrinowitsch, C., and Libardi, C.A. (2017). Crescent pyramid and drop-set systems do not promote greater strength gains, muscle hypertrophy, and changes in muscle architecture compared to traditional resistance training in well-trained men. European Journal of Applied Physiology, 1-11. Moritani, T., and DeVries, H.A. (1979). NEURAL FACTORS VERSUS HYPERTROPHY IN THE TIME COURSE OF MUSCLE STRENGTH GAIN. American Journal of Physical Medicine & Rehabilitation, 58 (3). Myer, G. D., Paterno, M. V, Ford, K. R., and Hewett, T. E. (2008). Neuromuscular Training Techniques to Target Deficits Before Return to Sport After Previous Cruciate Ligament Reconstruction. The Journal of Strength & Conditioning Research, 22 (3).